January 12th, 1869 in Raleigh, North Carolina. James G. Poole was born circa 1844 in North Carolina.1 He was the son of Alfred Poole and Rebecca (?) 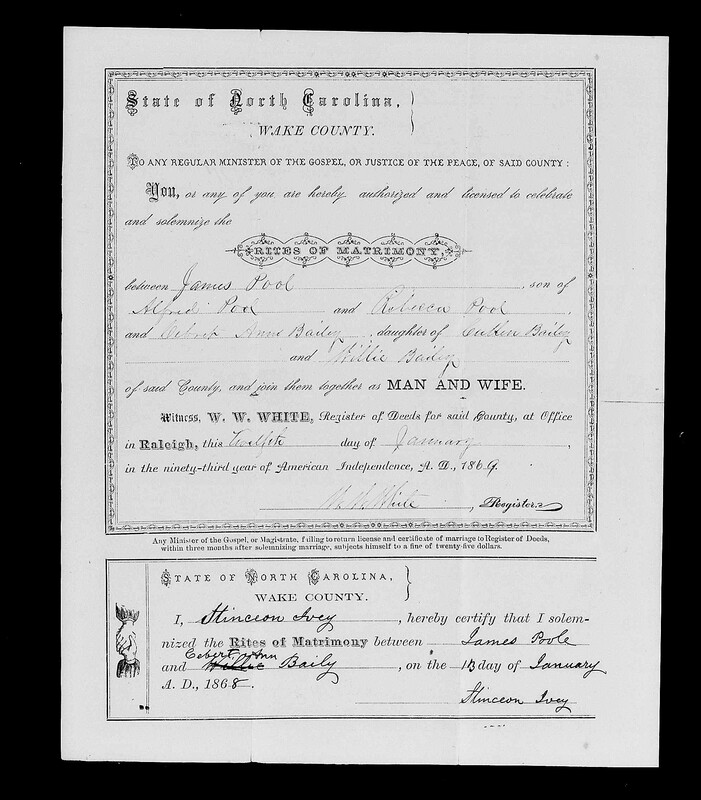 James G. Poole married Cebret Anne Bailey, daughter of Cullen Bailey and Mary Willie Bagwell, on 12 January 1869 at Wake County, North Carolina.1 James G. Poole died on 2 April 1921 in Raleigh, Wake County, North Carolina. Rabecar Poole was born circa 1874 in North Carolina. She was the daughter of James G. Poole and Cebret Anne Bailey. James W. Poole was born circa 1878 in North Carolina. He was the son of James G. Poole and Cebret Anne Bailey. Eve Poole was born in March 1882 in North Carolina. She was the daughter of James G. Poole and Cebret Anne Bailey. Lee Poole was born in November 1884 in Raleigh, Wake County, North Carolina. He was the son of James G. Poole and Cebret Anne Bailey. Lee Poole married Hattie Bell Thompson, daughter of Andrew N. Thompson and Mary Carriginton, on 21 July 1910.1 Lee Poole died on 27 May 1916 in St. Mary's, Wake County, North Carolina, at age 31. He was buried at Bagwell Family Cemetery, Garner, Wake County, North Carolina. Ada Poole was born in November 1886 in Raleigh, Wake County, North Carolina. She was the daughter of James G. Poole and Cebret Anne Bailey. Oscar C. Poole was born in July 1889 in North Carolina. He was the son of James G. Poole and Cebret Anne Bailey. Era B. Poole was born in May 1882 in North Carolina. She was the daughter of James G. Poole and Cebret Anne Bailey. Malliesch Poole was born in February 1894 in Raleigh, Wake County, North Carolina. He was the son of James G. Poole and Cebret Anne Bailey. Hattie Bell Thompson was born on 22 August 1893. She was the daughter of Andrew N. Thompson and Mary Carriginton.1 As of 21 July 1910,her married name was Poole.1 Hattie Bell Thompson married Lee Poole, son of James G. Poole and Cebret Anne Bailey, on 21 July 1910.1 Hattie Bell Thompson died on 14 April 1928 at age 34 of tuberculoise. Leonard Casswell Thompson is the son of (?) Thompson. (?) Thompson is the daughter of (?) Thompson. Julia (?) was born circa 1832 in North Carolina. As of circa 1854,her married name was Pool. She married Alonzo Pool circa 1854.